There are a large number of examples where religious actors have contributed to peace and reconciliation. But there are also many situations where religion or the manipulation of religious affiliation has contributed to conflict or the escalation of conflicts. The values and ideas of peace and reconciliation can be found in all religions and constitute the basis for dialogue aimed at a common commitment for peace. The inter-religious dialogue is a privileged means for learning about a common future based on shared values. Religion and religious actors are present everywhere and can be mobilised for peace at different levels (personal, village, national and international politics). The UNESCO charter states that “wars originate in the minds of men”. Religion influences the minds of people, by communicating to the women and men of our times the authentic message of peace and brotherhood, of belief and hope. Influencing the conscience can help to give birth to behaviour favouring the positive transformation of conflict. Religious actors have access to political actors. This potential can be further developed. Awareness creation and reflection with religious actors on the risk of the escalation of conflicts and how to better use their potential for reconciliation. Capacity building in conflict transformation, promotion of human rights and civil education. 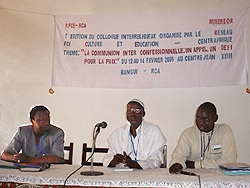 Accompaniment of religious actors in their organisational development and planning processes. Accompaniment to inter-religious dialogue processes. Facilitation of colloquia, fora, seminaries and workshops on related issues.